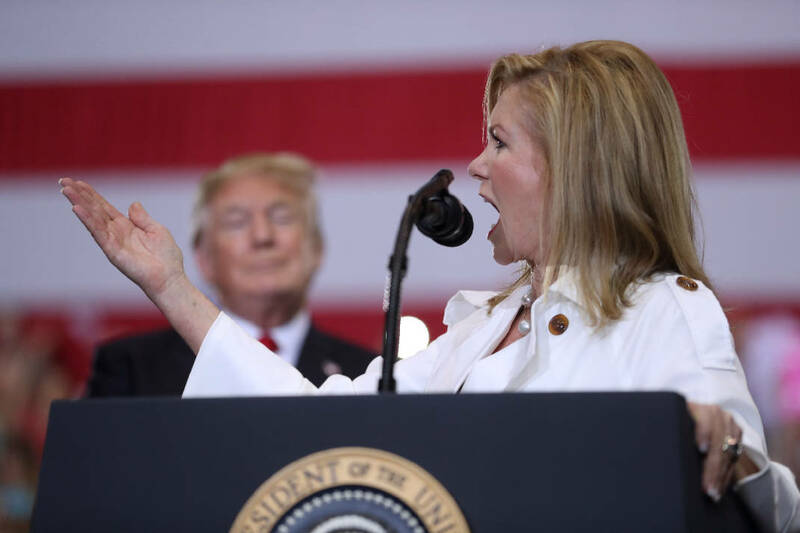 NASHVILLE — Republican U.S. Senate candidate Marsha Blackburn is praising President Donald Trump's nomination of Judge Brett M. Kavanaugh to replace U.S. Supreme Court Justice Anthony Kennedy while Democrat Phil Bredesen re-emphasized he will take a non-partisan approach in judicial confirmations if elected. Trump announced Kavanaugh's nomination Monday night. The judge now serves on the U.S. Court of Appeals for the District of Columbia Circuit. Blackburn, a Brentwood congressman, said in a statement that Kavanaugh "will make a fine Supreme Court Justice, and I thank President Trump for nominating a strong constitutionalist with a proven track record of upholding the rule of law." She said Tennesseans "are frustrated by liberal activist judges and justices who too often legislate from the bench. I know they will be well served by Judge Kavanaugh, and I encourage the Senate to consider his nomination expeditiously and continue to confirm strict constitutionalist judges to our federal courts." Former Gov. Bredesen said in his own statement that "an important part of a Senator's job is to approve or reject appointments the President makes to the Judiciary. "In the Senate, I'll vote for or against a nominee based solely on whether I believe them to be highly qualified and ethical -- not based on partisan politics. Looking ahead: the President's Supreme Court nominee deserves a fair and timely confirmation hearing. This is an opportunity for the Senate to get back to basics and show it can do its job." Last week, retired Tennessee Supreme Court Chief Justice William 'Mickey' Barker, a Chattanooga Republican, noted in an interview that as governor Bredesen appointed Republican Bill Koch to the state Supreme Court. While Kavanaugh's nomination already triggering a fight in the narrowly divided Senate where Republicans hold a narrow 51-49 seat majority, the battle is expected to over and done with by the time Tennesseans decide in the November election who will replace retiring Republican U.S. Sen. Bob Corker in Washington. But nominations to fill future vacancies in federal higher and lower courts are certain to come in future years. * "He is a well-respected jurist who understands the importance of upholding the Constitution and applying the law in a fair and independent manner. I look forward to meeting with Judge Kavanaugh during the confirmation process." — U.S. Sen. Bob Corker, R-Tenn.
* "The president has nominated a well-qualified jurist. Unfortunately, the Senate has gotten into a bad habit of treating good people as 'innocent until nominated.' Instead, I hope this confirmation process will be conducted with dignity and respect so that we may learn more about Judge Kavanaugh's character, temperament and attitudes." — U.S. Sen. Lamar Alexander, R-Tenn.
* "Judge Brett Kavanaugh is an exceptional choice by President Donald Trump for the Supreme Court, and if confirmed, will uphold the Constitution and defend the rule of law. [He] is uniquely qualified to serve on the Supreme Court, and his record shows that he will apply the law as written and enforce the original understanding of the Constitution." — Tennessee Gov. Bill Haslam, chairman of the Republican Governors Association. * "Judge Kavanaugh's extensive record of proven, conservative ideology will be essential in the future decisions of the Supreme Court. [L]et us remember that the role of the Supreme Court is to interpret the Constitution as our Founding Fathers intended, and I believe that Judge Kavanaugh will carry out this role faithfully." — U.S. Rep. Chuck Fleischmann, R-Tenn.
* "It is a sadly predictable and a foregone conclusion that Trump's pick, from a shortlist approved by Leonard Leo and The Federalist Society will not only entrench the 5-4 conservative dominance that gave us Citizens United, gutted the Voting Rights Act and, in its most recent term, trampled on labor rights and gave extremists the right to discriminate and erode the protections long afforded minorities, but will move the Court even further to the right. I have profound concerns." — U.S. Rep. Steve Cohen, D-Tenn.